Shopping for Teenage Mutant Ninja Turtles Bobble Heads? 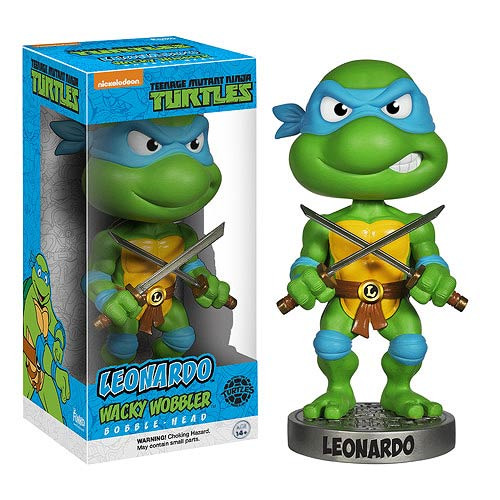 Teenage Mutant Ninja Turtles' Leonardo as a bobble head! Features Leonardo with his katanas and blue bandana! Featuring your favorite crime-fighting mutant, this Teenage Mutant Ninja Turtles Leonardo Bobble Head makes for a must-have collectible and desk display piece! Not only does this 7-inch tall TMNT Wacky Wobbler from Funko feature a Leonardo whose head bobbles when pressed, but his faux-stone base is personalized with name! Add a little fun to your desk at home or work with this Teenage Mutant Ninja Turtles Leonardo Bobble Head! Ages 14 and up.